The Hincheslea estate is 3 kilometres (1¾ miles) in a south-westerly direction from Brockenhurst village centre. The Hincheslea estate occupies an outlying spur of land close to Hincheslea Bog and Long Slade Bottom. It was one of four local Saxon manors mentioned in 1086 in the Domesday Book, William 1’s survey of his new lands commissioned shortly after the Conquest. Hincheslea was then called Hincelveslei, the meaning of which refers to a red deer hind-calf. Domesday noted: ‘Wihtlac held ½ hide; it answered for as much. Now it is in the Forest. Land for 2 ploughs. The value was 20s. Hincheslea was shown by mapmakers Richardson, King and Driver in the late-18th century as Hinchesly. But by 1817, the Reverend Henry Comyn noted that William Schreiber, Esq, was living at Hinchelsea (sic) House with eight children and six servants. Wife Mary was inexplicably omitted from Comyn’s record. Originally built by Admiral Thomas Wolley, by 1832 Hincheslea Lodge, as it was then known, was occupied by Mrs. Hippisley Coxe. A print of that year - illustrated here - was included in ‘Views of the Principal Seats, Maritime & Landscape Scenery, in the Neighbourhood of Lymington’. 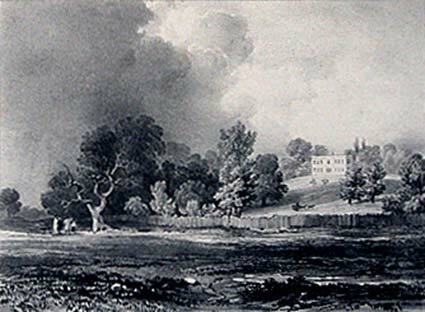 Drawn on stone by Louis Haghe, the print shows a house of some distinction, set on a wooded knoll overlooking a parkland setting. Wonderful, wildlife-rich New Forest landscapes surround the Hincheslea estate, including the ancient, unenclosed woodlands of Hincheslea Wood; Hincheslea Bog; lowland heath around Hincheslea Moor and Horseshoe Bottom; and the re-seeded grasslands of Long Slade Bottom. Quite apart from landscape and wildlife interest, though, Hincheslea Bog has in the past had much more to offer. Emmy Waterman, quoted in Before We Go, compiled by Richard Taylor, recalled that during the First World War, all the pupils of Brockenhurst Village School on Fridays would go to the bog to pick sphagnum moss for use as a wound dressing in the military hospitals - sphagnum moss, apparently, has more effective absorbent qualities than even cotton wool. And in Brockenhurst and the Two World Wars, compiled by John Cockram, it is noted that in 1915, the Reverend J.E.C. Patterson appealed for helpers for the Brockenhurst Sphagnum Moss Depot.